I am having issues connecting to metawear using the python wrapper api. This is the error I am getting, can someone help or point out the issue here ? That message can be ignored. Monitor the BT activity and confirm that a connection is indeed failing to be made. I am having the same error message. Nothing happens on the device (MetaMotionC). I have to KeyboardInterrupt. I ignore it. But nothing happens. LED does not bling. So I Control-C to exit. Read the second sentence from my post. Yes, I read the second sentence. There is no activity. What's the solution? I checked that battery is alive. My post asked you to monitor the BT activity. If you have done so, post a log of what the BT adapter was doing when you ran the led script. I have two virtual python environments Python 2.7 and Python3.5 in which I installed the metawear packages. I had some installation errors installing some dependencies for metawear in Python3.5 so metawear python examples hanged in connect. Fortunately, in Python2.7 the example scripts (e.g. led.py) work fine. ii. With that, the build succeeded, but not working. So for now, I can continue in Python2.7 environment and try to do a clean install metawear packages later. If anyone else had similar problem installing metawear packages in Python3.x environment and got it working, your please share any insight you may have. Check out tools like btmon, learn to use it. A few updates. First I updated the tutorials to include a Ubuntu based setup, please see here: https://mbientlab.com/tutorials/Linux.html. Second, I ran a few examples and did notice that a few times you may get an error because the BLE fails to connect. You either need to try to connect again or update the Python scripts to automatically try to connect again. The LED successfully turned on in this example and the BTMON shows a successful command set. Continue to ignore the src/blestatemachine.cc error. thank you for the nice tutorial. I set everything up like you described it on ubuntu and python 2.7. Now, most of the time i get the mentioned error. I tried to catch it as a python exception, but i always get a buffer overflow and python termineates completely. Have you found a workaround, so i don't have to restart my script manually until i works? 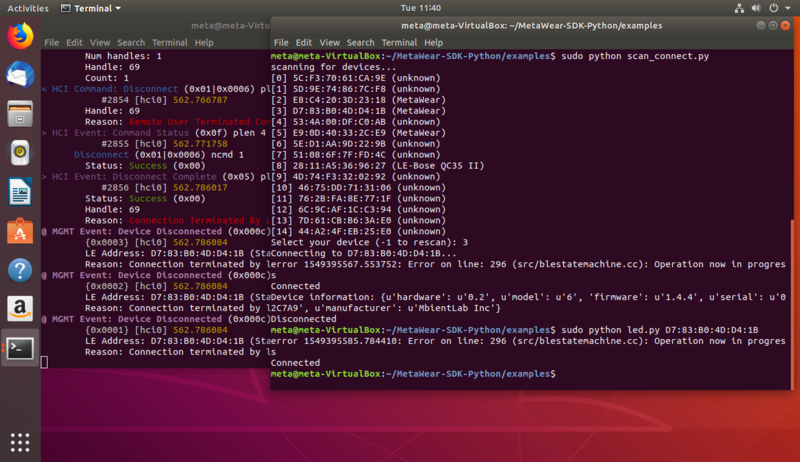 I am using Ubuntu 18.04 and Python 2.7 and get the same error with pymetawear library and the libmetawear python library and even the scan_connect.py example provieded on github. the line error155.... even appears when the connection works. If you are running on a small system like a raspberryPi, can you try to increase the swap? Can you try to run this on a different system and see if the same issue occurs (for example if you are running on raspberryPi with Raspian, try running on a Desktop Ubuntu). I am using a rather capable Dell Optiplex and Ubuntu 18.04. Today I am lucky and I only got once the buffer overflow error back. So I can't reproduce the error now. Today it works like a charm. If i have bad luck another day i will try observing the swap. I was actually planning to use a Pi in the future. So if it fails there i am prepared. Thank you!